Sikar, March 25: In the first list of candidates, the Bharatiya Janata Party (BJP) fielded 14 sitting MPs and dropped the only female lawmaker from Rajasthan. As the party retained Sumedhanand Saraswati from Sikar Lok Sabha constituency many party workers were joyous, many weren't. 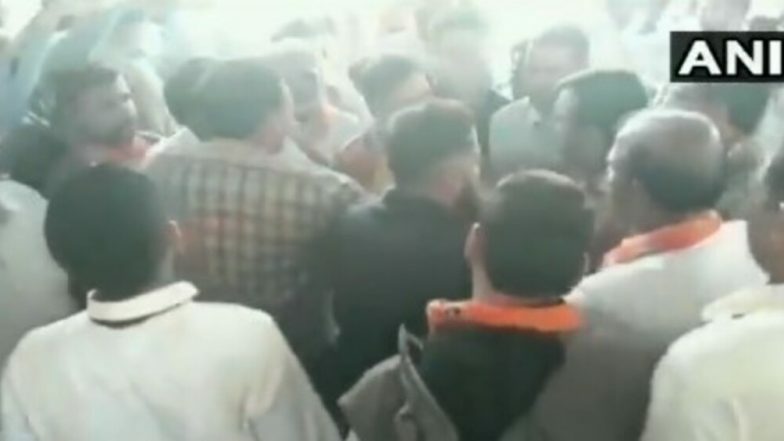 On Monday, a quarrel broke out between supporters of Sumedhanand Saraswati and another group of his opponent over the former lawmaker being given ticket once again. In the video of the incident which is going viral on the internet, it can be can that Sumedhanand's supporters and its opposition are protesting against each other. Jagdish Lora, Zila Parishad member, alleged that Sumedhanand had paid no attention to his constituency. BJP MP Sharad Tripathi Beats Own Party MLA Rakesh Baghel With Shoes at Meeting in Uttar Pradesh, Watch Video. For the Sikar parliamentary seat, the saffron party has decided to nominate Sumedhanand Saraswati once again. After which a meeting was organised at the eight constituencies of Sikar district. In the meeting, the candidature of MP Sumedhanand was opposed by rival party workers in BJP's local unit. The two groups scuffled and raised slogan against each other. Meanwhile, the elections in Rajasthan will take place on two phases. The desert state will vote to elect 25 parliamentarians in the fourth and fifth phase of Lok Sabha polls. Rajasthan will vote on April 29, 2019, and May 6, 2019.